Last night, a few of us decided to hit the theaters. 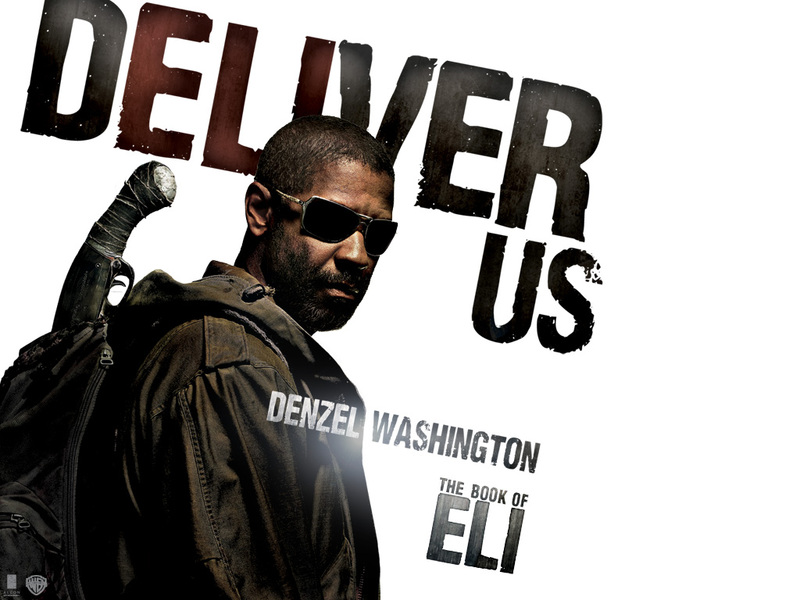 I haven't been to the movie theater in a while, and I knew this Book Of ELI sparked my interest a few months ago. So we decided to go and see what was new up Denzel's sleeve. First of all, it's Rated R for a reason. There's a ton of violence, sexual innuendos, and overall adult themes, but the core of this film is unlike anything we've seen before. The premise, Eli (Denzel Washington) is walking west. He eats off the land, protects himself from hijackers with a vicious blade, and is on a mission. He explains it in the movie, "After the blast he heard a voice tell him to walk west where he could take the book (The King James Bible) to a place where it would be kept safe." The movie is set in some sort of apocalyptic time where everyone was in survival mode. Much like Mad Max back in the 80's, this time is one of scarce resources where only the tough survive. If you can stomach the battle scenes, the message will blow you away. Eli takes the book through a town where Carnegie (Gary Oldman) is looking for "The book." Several times they refer to the power of the words in the book, and it's power to transform and lead people. So Carnegie is on the hunt for the book for his own personal power game. One of the most powerful points in the movie is when Carnegie and his thugs have Eli cornered, and they ask for the book. Mind you, Eli has been protecting the book with his very life, but for some reason, he gives it over to the motley crew. Eli's walking partner asks, "I never thought you'd ever give up that book." And Eli replies, "I took for granted just reading it. I better live my life and do what it says." I won't ruin it for you any more. This is an interesting look at how to present the gospel in a vehicle our culture can hear and will understand. I haven't read any secular reviews on the film, but there is no subtlety here. The Gospel of Jesus is CLEAR. The message of the Bible is CLEAR. The power of God's Word is CLEAR. It's just driven by some pretty gross violent scenes. Denzel Washington an Gary Oldman are brilliant actors and carried the movie with poise and style. This may go down as a classic once the culture figures out what do to with the message. Andy, I got the chance to go check this out the other night as well and strictly from a movie-goer perspective I thought it was a sweet movie. But I have a few questions as to its theological meaning. To say that “the gospel of Jesus Christ is clear. The message of the Bible is clear. The power of God’s word is clear.” seems to be an overstatement. First off, Jesus Christ is never mentioned, the need for redemption is never mentioned, nor is how redemption is made. So how is someone to assume that salvation comes through Christ? At the end of the movie just before the credits roll it shows the Bible being set on the shelf right next to the Torah and Quaran. This might be a little stretch but would this not be to symbolize that it is just another sacred piece of literature and thus degrading it. Like the Pharisee’s Eli, Solara and Carnegie “search the Scriptures because you think that in them you have eternal life; and it is they that bear witness about me, yet you refuse to come to me that you may have life (John 5:39-40).” Granted Eli does make a subtle mention that he should allow it to change his life. But I think the strongest defense to this was in an interview that Denzel gave on the Today show with Matt Lauer. He was asked if it was a Christian movie and he replies to the effect of “if it was a Quaran then it would be a Muslim movie, if it was a Torah then it would be a Jewish movie.” So there is a world changing Bible, without a world changing Christ; which in the end works against the church’s message and could be argued does more damage than it does good. Which is more deceiving, the clock that is five minutes off or the clock that is 5 hours off? 1. The fact Eli is following the message of God by faith to walk west and protect the book is really what the disciples did in their time, right? The idea that faith is “knowing something when you dont know it” was a prominant line for me to come to my conclusion. 3. The idea that in Elis world there was nothing, adds to the power of the message of the Bible. They had NOTHING that western culture has or takes for granted, but the power of Gods word drove EVERYTHING Eli did. It wasnt about accumulating things or finding personal happiness, rather; Eli was walking by the faith God gave him in a hopeless world. 4. I guess the message might be similar to Pauls word in Romans of Abraham ” he believed and it was credited as righteousness.” Sure, I believe in Salvation through Jesus as the only way, but dont you think Eli read John.14:6 too? Afterall he had the whole book memorized and was trying to live by what it said. 5. The placement of the Bible at the end was no more symbolic than the Bible taking its place in History. Remember the Alcatraz Press was there to tell the story of human history and the Bible fits beteeen the Torah and the Quran in history. Fact! I guess in all, if your looking for a film that says “pray this…and accept Jesus” you wont find that in this movie. But if you are looking for a gritty story of faith, hope, and the power of Gods word, then Eli has it. Thanks Cliff. Love the discussion. I guess my question would be, would the story have changed at all if the book Eli was protecting was instead the Torah or Quaran? I would say no. I think that the story could be done the exact same way with a Quaran in Eli’s backpack instead of a Bible. There is nothing in the movie that is unique to the Christian faith as to set the movie apart as a “christian” movie other than the fact that he is carrying a bible. Maybe the fact that there is power in the word he is carrying, but even that would be claimed by the Jews and Muslims. Wouldn’t it? I think Cliff’s right about how it could be about any other book. I think they did it on purpose for better reception of the movie among the two other religions. Also, I think they carefully selected “Eli” as the name because Eli means one God in Hebrew. “Elohim” means God(plural in the sense of the Trinity). In the Torah and old testament, “Elohim” is found, but I think in respect of Islam’s belief of only one God, they used Eli. The thing I would like to point out is, the message from the movie comes straight from the Bible, and not exactly what is written in the Torah or the Quran. Also, the fact that they used the Bible and not the other two books, makes a lot of impression on people’s mind. It is a start. If you want to argue that in the end, the movie works against the church’s message about not having a changing Christ… look around you and all the sins of the Christian church and its people. Look at our history, and tell me it didn’t do more damage than good. There is a reason why Christianity has such a bad image in the world and why people will turn away simply hearing the word Christ. I think the movie is made perfect by faith. It’s all about the faith, the family and your friends!!!!!! Why the King James version? I have not seen the movie, plan to. Is your choice of the King James version due to the movie? I am not familiar with the differences in the versions. After seeing this movie, you will notice (and those that know the difference between the books of faith will understand) that while the King James bible is the “book” being protected, no other reference is made to anything beyond the Old Testament. The name of the Old Testament in Judaism is “Tanach” which is an acronym for the three sections of the Old Testament: Torah – equalling the five books of Moses, Neviem – which means Prophets, and Ketuvim – Writings (such as Psalms, etc.). See Wikipedia for an excellent explanation. The only difference is that the Torah is the first five books but the King James bible includes the aforementioned 3 sections that make up the entire Old Testament AND the New Testament. Judaism does not believe in the New Testament (so really the “Old Testament” to Judaism is THE testament and never became “Old”). So the insertion of the Quran at the end was likely as was said in a prior post, to be politically correct but the message was quite Judeo-Christian in that the “New Testament” never had a role in the movie other than alluding to it’s existence by centralizing on the King James bible.